They say that as you age you become more content with what you have and less likely to feel the need for change — be it upgrading your Sylvania for a plasma, trading in your Camry for a Prius, or replacing that steel, aluminum or titanium road bike for one of today’s carbon flyers. I don’t know if that’s true. But I can tell you that even while the local bicycle shops slowly filled with carbon featherweights, even while the pro peloton went plastic, and even while my racing buds started riding and raving about their composite wonders, this aging roadie stubbornly refused to upgrade his 1999 titanium bike, telling anyone who asked that I didn’t believe anything could climb, corner or cruise better — high-tech composite technology be damned. What an idiot. Whether it was the onslaught of middle age, my frugal Scots blood or whatever, my ignorance cost me about four years (some 20,000 miles) that I could have been out there enjoying the incredible benefits of modern technology. 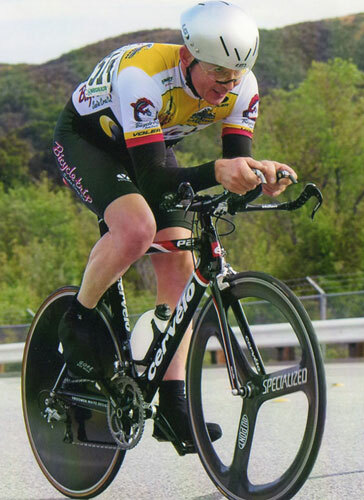 If you follow pro racing you already know about this thoroughbred. It’s been one of the most-winning machines for the past couple of years under team CSC, ridden by aces such as Jens Voigt, Stuart O’Grady and Fabian Cancellara, who wore the yellow jersey for six days in the ’07 Tour de France. Impressively, Cervélos have won the last two Paris-Roubaix classics and been voted the top bike by cyclingnews.com for many consecutive seasons. These stellar results, and the fact that my good buddy Antonio, who has painstakingly analyzed and road tested every super bike out there, got a Cervélo and couldn’t stop raving about it, convinced me to stop living in the past and hop on the carbon express. Contributing was my decision to start road racing again and wanting every ounce of modern technology at my command. Still, it took me awhile to decide to buy the Soloist. I was hung up on the huge down tube, which is more than three inches tall. I worried that the bike would be too stiff and might beat up my damaged back. I also reasoned that a down tube that large would have to be heavy, and I wanted a lighter race bike than my ti ride (16.8 pounds). I initially thought that the fire-engine-red paint and billboard-size graphics looked garish, too. 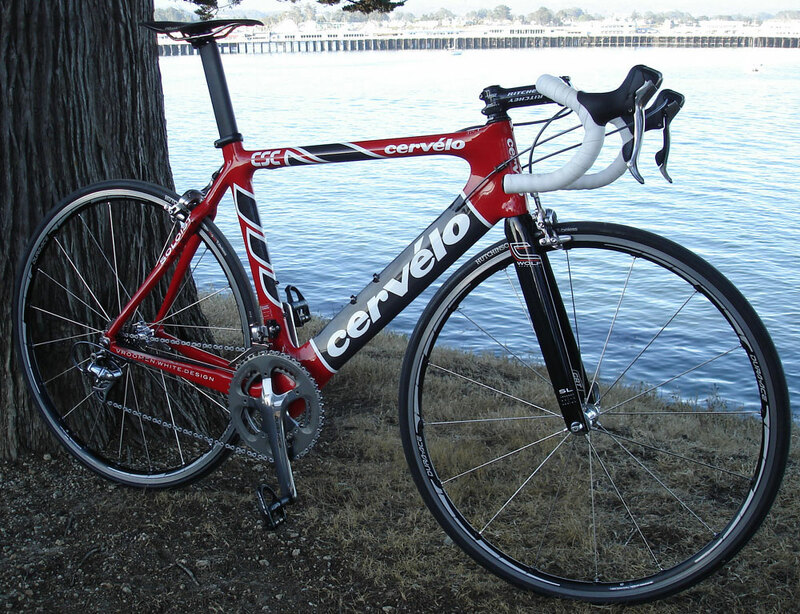 Mind you, I had not seen the bike in person, only on Cervélo’s cool website and in pictures in cycling magazines. After weeks of analysis paralysis and plenty of goading from Antonio and riding pals who insisted I’d go faster on it, I decided that if the bike could win pro races I should quit worrying and place the order. Due to heavy demand for these highly touted and successful bicycles it took awhile for my Soloist to arrive. When I was finally able to open the box, I was thrilled. The paint job that looks so bold in pictures is even more so in person. The finish is super high quality — liquid, glossy and deep with the giant Cervélo logos so nicely integrated there are no perceptible transitions. Plus, as a compact monocoque aero frame, every tube is elegantly shaped and blends into the next. The internal cables seem to melt into the down and top tubes, maximizing aerodynamics, preventing rattles and easing cleaning (click photo to zoom). Overall, the effect is more Lamborghini than two-wheeler, and it grows on you fast. It doesn’t hurt that on every ride someone comments how cool this bike looks. When you’re standing over the Soloist rather than viewing a photo, you can see that the huge down tube is only that way from the side. The tube’s top is razorblade thin while the bottom is round, which creates a wing profile. Running your hands over the other tubes (because you can’t just look at this bike, you have to touch it), you feel that the seat tube, top tube, stays, seatpost, and even the head tube are aero, too. 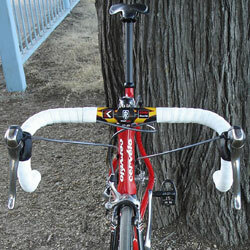 Same for the Wolf fork, which is so aero the blades look, well, blade-like. Believing that a racing bike’s aerodynamics are among its most important attributes, Cervélo engineers Phil White and Gérard Vroomen went to great pains to make the Soloist as aero as possible. Currently, the industry trend is to offer the lightest carbon bicycle. But lightness mainly helps when you’re climbing. Reducing wind drag results in energy savings all the time (click photo to zoom). Cervélo’s wind tunnel tests show a 3% gain over standard-tube bicycles. This delivers an additional 10 meters each kilometer — a significant edge in time trials or in breakaways, as Cancellara has nicely demonstrated. To me the aerodynamics are most noticeable on descents and in pacelines because I seem to be riding the brakes more than ever. Free speed is a lot better than speed earned by pedaling. 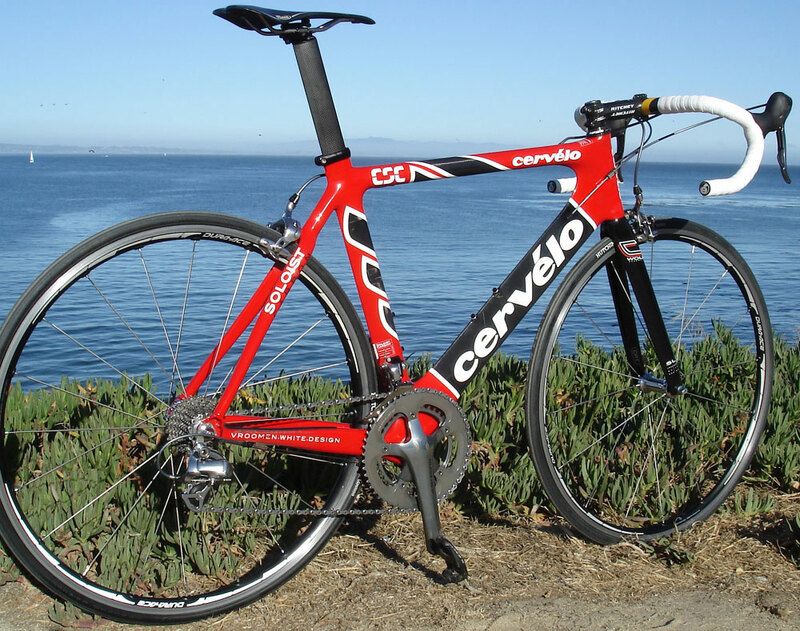 Speaking of the seatpost, Cervélo’s is not an integrated design (also called a “seat mast”) like on superbikes such as Giant’s TCR Advanced Team and Trek’s Madone. Still, the Soloist boasts a post every bit as aero as the frame it fits into. It’s almost two inches wide and probably as efficient as a true integrated post. Thanks to its aero shape, the post can’t swivel so you never need to align the seat with the frame, a nice benefit (click photo to zoom). 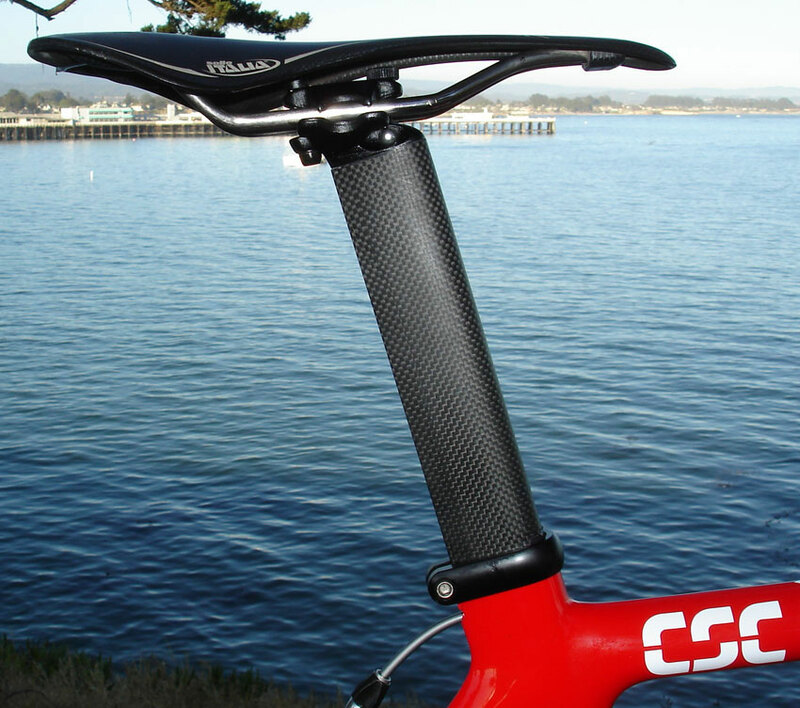 Even better, unlike with integrated seatposts, there’s no need to cut this one to the correct length or use special pieces to size it, as required by some seat masts. 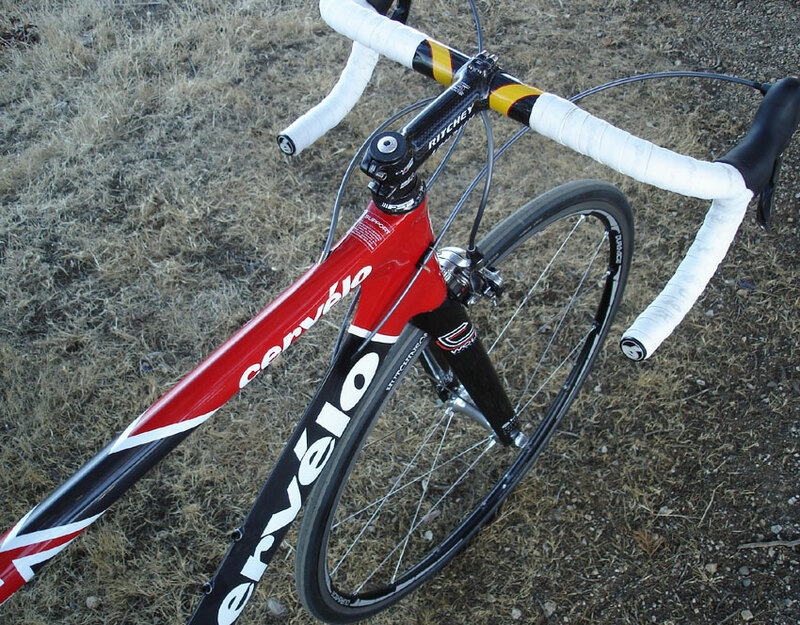 The Cervélo post is removable for easy bike shipping, too. There was one issue that required fine-tuning: a bit of play between the post and frame that was apparent as a slight knock when lifting the bike by the seat. The fix is a thin shim installed when inserting the post. The Soloist delivers power wonderfully. I swear I gain a couple of centimeters with each pedal stroke on climbs, and my jump and sprint, always non-factors in races, have begun to have a little sting. What’s at work here is the way the oversize down tube, seat tube and chainstays brace the bottom bracket for maximum pedal power. 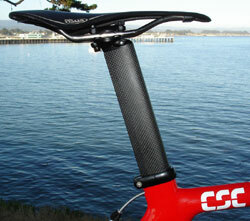 That oversize seatpost reduces flex, too (click photo to zoom). 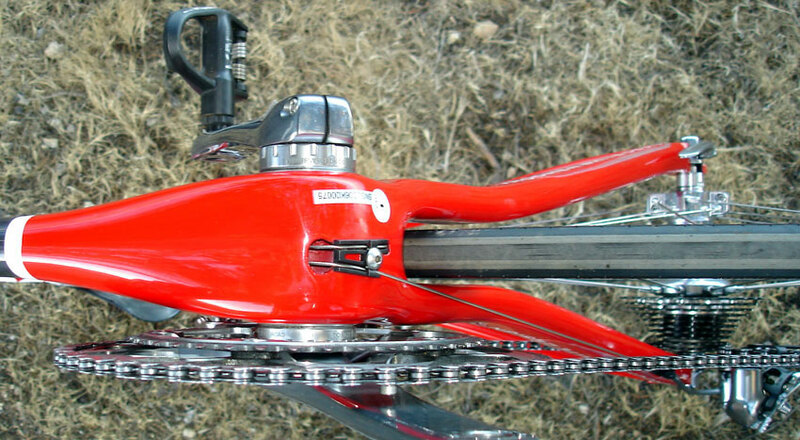 If you glance down you can’t help but notice the difference compared to traditional bottom bracket intersections. It’s obvious that there’s no place for your effort to go but to the road. 39 x 27-tooth gear (39 inches) I formerly rode up hills and the 39 x 25 (42.1) that now feels just as same. This lets me hang that much better when the road goes vertical. Maybe more telling is 1.49 watts per kilogram, the difference between my output on my old and new bicycles on the 5-mile climb my coach uses to test power (same components and wheels on both bikes). Helping boost stiffness is Cervélo’s Smartwall technology. 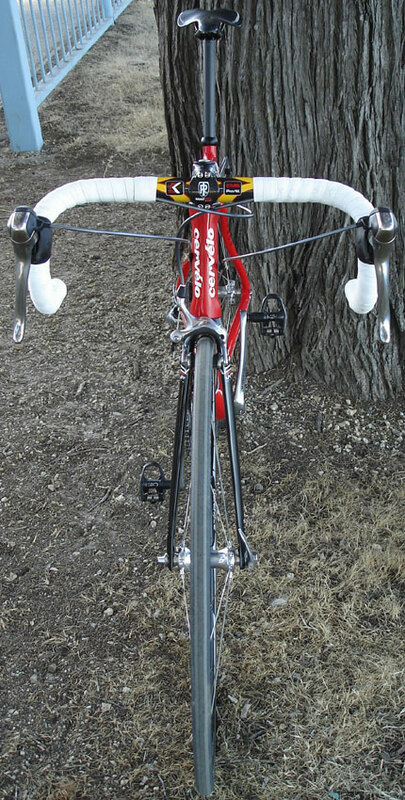 The sides of the aero tubes are butted to boost lateral stiffness, but they’re thinned on the leading and trailing edges for vertical compliance. The boost in pedal power is awesome, but the biggest shocker to me is the Soloist’s ride quality. This is the most efficient road bike I’ve owned, and it’s more comfortable than my ti bike. I heard that this would be the case from Antonio and carbon fans, yet I’d never felt it on other carbon bikes I’ve tested. They were nice, but they didn’t glide over rough pavement, insulating me from abuse nearly as well as titanium does. I’m convinced that a major contributing factor to the excellent all-around ride is the use of the same material throughout the frameset. On my titanium bike I have a carbon fork. It’s fine, but I can sense a difference in the materials. The Soloist has a more balanced or integrated feel that surely helps the superb all-around ride characteristics. At 16.25 pounds, the Soloist is the lightest bicycle I’ve owned. There are plenty of 14-pound carbon machines out there, although none as aero as the Soloist, unless you want to go with Cervélo’s lighter Soloist, the SLC-SL, which weighs 200 grams (7.14 ounces) less but costs $1,300 more. Or, if aero is not your thing, check out Cervélo’s Paris-Roubaix-winning R3 SL, which at about 840 grams (1.88 lbs.) is one of the lightest frames in the world—and apparently one of the toughest, too. When you build up one of these carbon flyweights, it’s a strange experience. The frame, fork and carbon components have almost no heft. Installing them doesn’t feel “right,” as if you can’t get things tight enough and they’ll move or slip when you’re riding. I studied up before the build to get it right, then followed the recommended assembly procedures and fastened everything to the correct torque. Even so, I was concerned on my initial rides that something would loosen or snap. Now, nearly 1,500 hard racing miles later, I know better. As long as you follow directions carefully, torque things properly and use quality components, carbon bikes can handle anything. Sucking wheels in pacelines on my Soloist, I’ve hit unseen holes so hard I almost crashed. I’ve bunny-hopped other obstacles, landing less than delicately. I weigh 170 pounds (77.3 kg) and these abuses have had no effect whatsoever on the frame or components. Carbon is more prone to failure from damage that begins as a cut or nick, so you wouldn’t want to toss your machine on top of a pile of other bikes or let it fall against a parking meter. But, that wouldn’t be good for a metal frame, either. Now that I’m aboard a carbon bike right out of the pro ranks, I run into other riders like I used to be. They’re still holding out, unconvinced by the popularity of composite materials. They want to know what changed that suddenly catapulted carbon to the front of the peloton (click photo to zoom). I believe what’s happened is that so many companies have begun building composite frames since the inception of the first production bike, the 1975 Exxon Graftek, that the technology has advanced to where we’re finally getting the ride that’s been promised all these years. Carbon is a fabric comprised of threads, meaning that current designers (aided by sophisticated software) can fine-tune the material and how best to use it, almost to the molecular level. They can determine the optimum thread direction, number of layers, orientation of lay-up and what other composites to include to dial the ride to perfection. The result is new standards in efficiency, comfort and lightness. And you can bet on the technology continuing to improve. In part this carbon revolution explains how a 12-year-old Canadian company called Cervélo — not an Italian, Asian or US firm as you might expect — could match up with the Treks and Giants of the bike industry. Like most companies producing composite superbikes today, Cervélo has its frames made in China. They’re formed from proprietary specifications developed at company headquarters in Toronto. If you’re still holding out, I recommend heading to your local bike shop and taking a test ride on a Cervélo or the carbon flyer of your choice. I think you’ll be amazed.